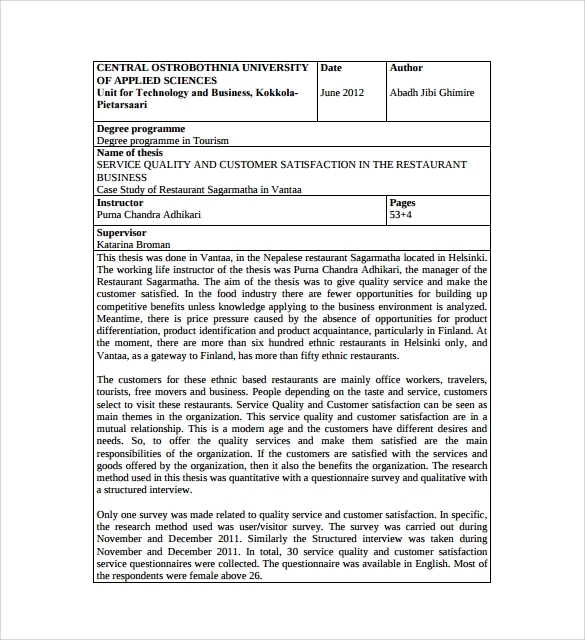 Restaurants in normal cases conduct various surveys in order to improve their services and add a variety into them. 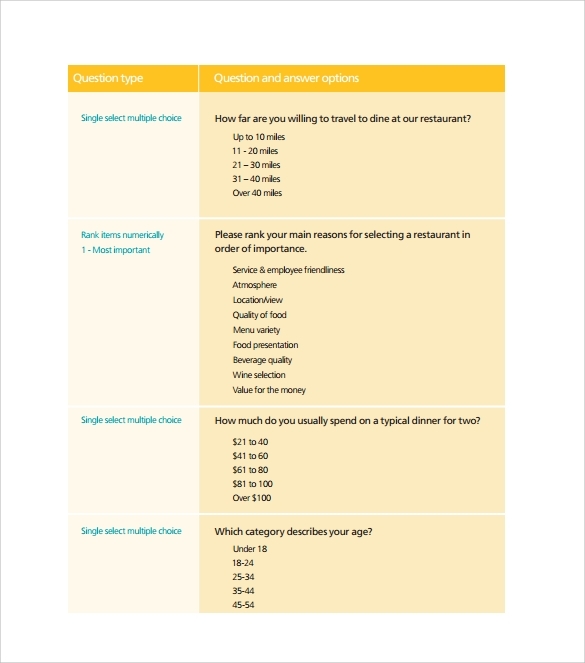 Ideally, a restaurant survey template should consist of two elements, first, it should cover internal feedbacks related to the services and secondly it should act like an eye opener to the establishment itself, it means it should have some elements where people can compare you with other places or eating joints. The Internet is flooded with many formats that are available in word, excel and PDF. You can add or subtract questions as per your choice. 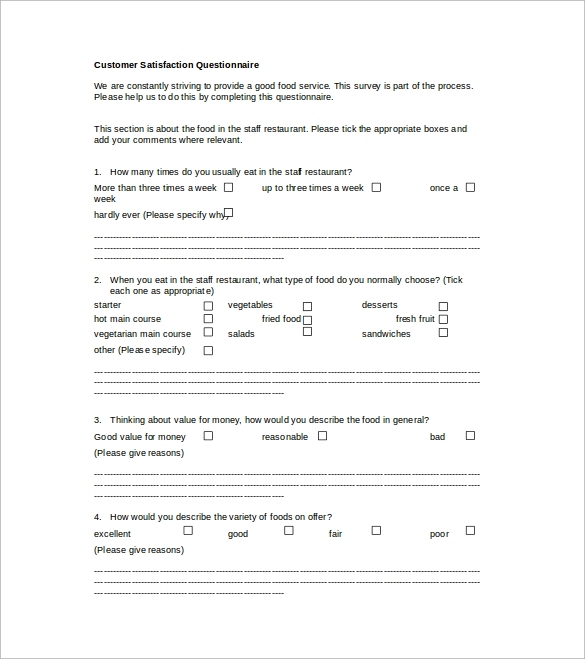 However, most of these Feedback Survey Templates formats strike a balance with the flow of the information. 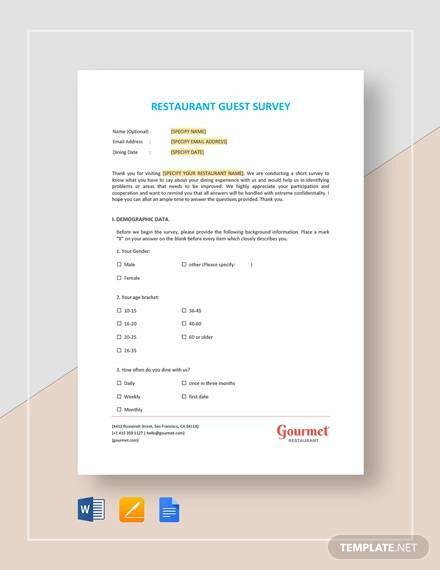 They are also important because of their impeccable language; this language is the primary requisite of any basic restaurant survey template. 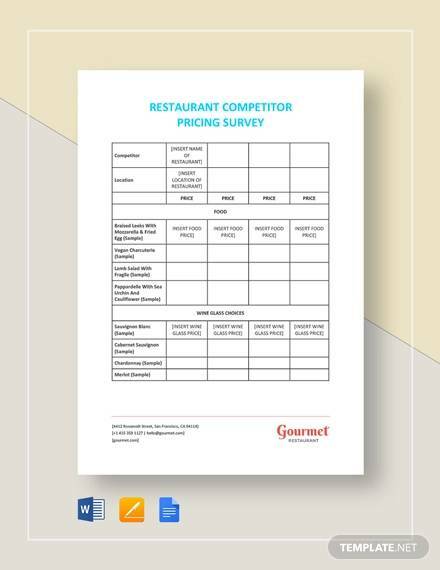 The motive in details behind conducting restaurant surveys. 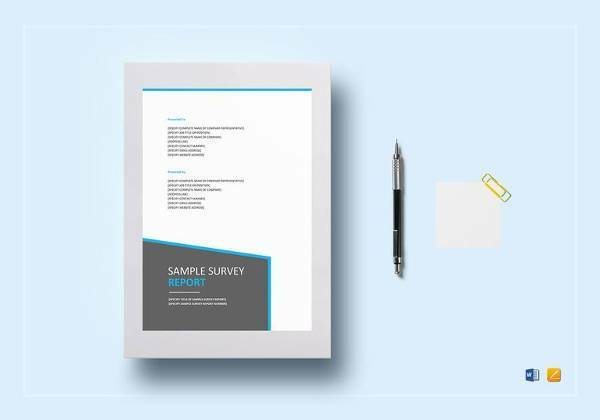 The sole motive behind conducting any kind of survey is to connect with the customers for improving your business. 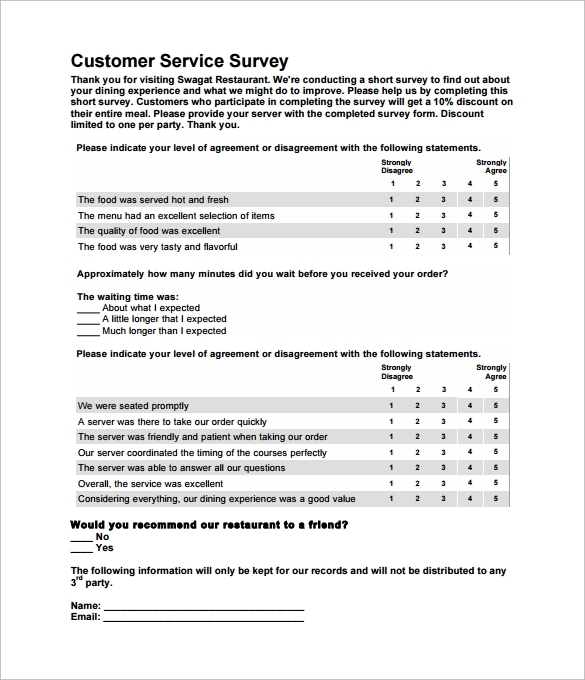 Restaurant surveys are also done for providing you with proper insight about the kind of opinion your customers hold about your restaurant. What they liked and disliked, their expectation when they again pay a visit to your restaurant, these are the facts you can derive from the survey.Through the survey, you will have an idea as what areas you need to work upon for making the restaurant experience for your customers worthwhile. So that they keep coming back and recommend others for their satisfaction level. The quality of the food. The collection in the menu section. The price compared with the food quality. The behavior of the staff. The location of the restaurant. The outdoor and indoor decoration. The overall ambiance and experience. 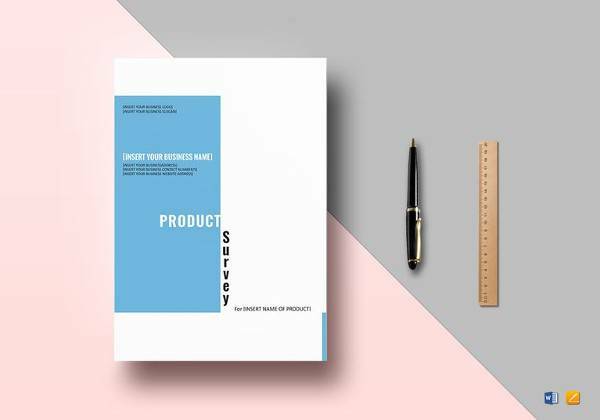 By including questions on the above topics for your survey, you will be able to build a better relationship with your clients, which will contribute in improving your business. 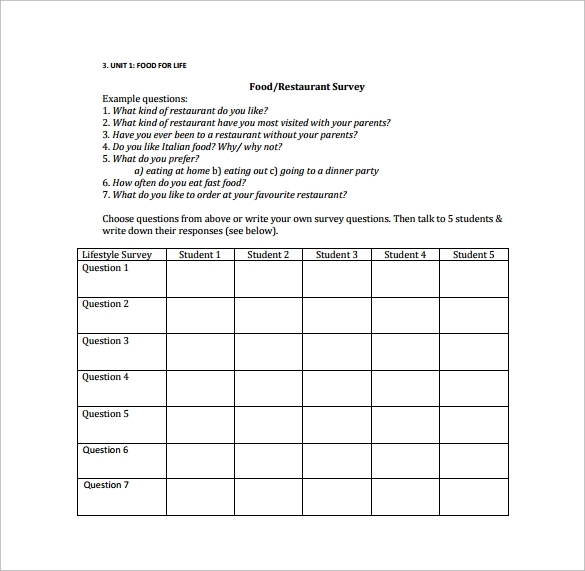 Implementation of restaurant surveys. Or online surveys through emails, websites or social media. 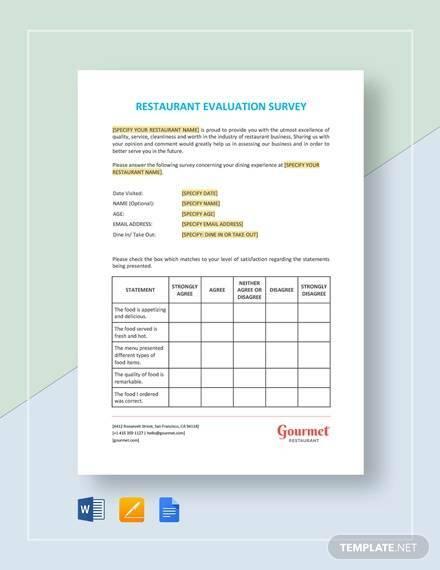 Use any of the above option for performing the restaurant surveys and gain the customer’s valuable feedback for predicting their future behavior. 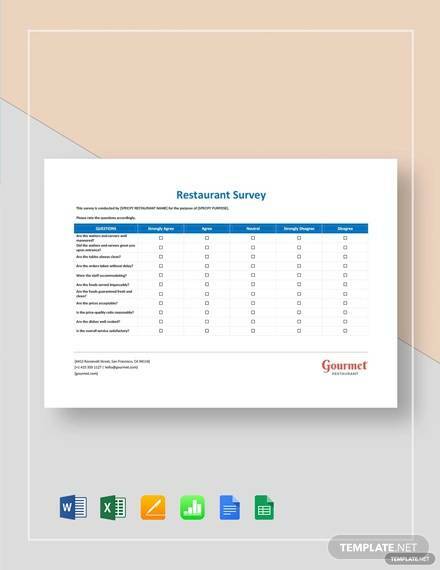 Restaurant Survey Templates and Their Need. 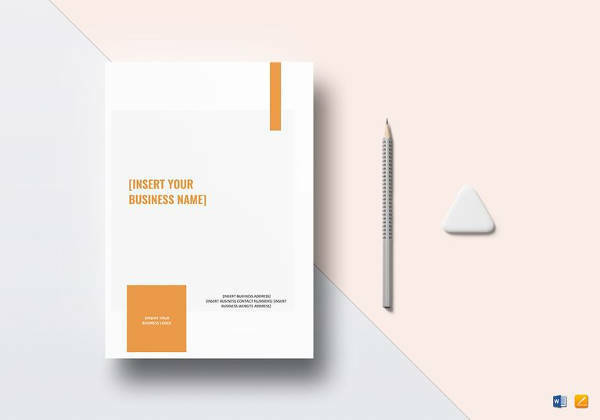 In our collection you will find various types of templates ready to be used by you. Simply choose one of them according to your restaurant type and requirement, and customize them for your use. 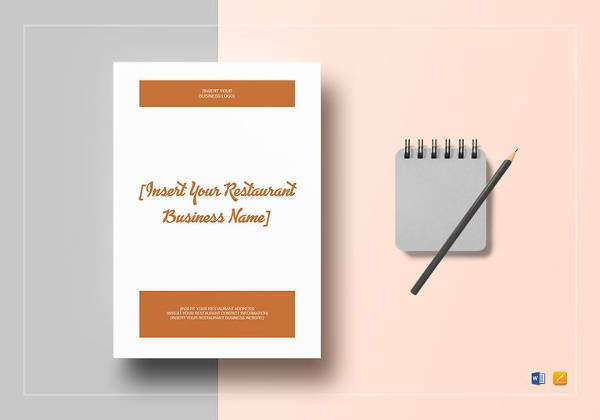 You can add your own interesting questions from your side to the template for personalizing it for your restaurant type. 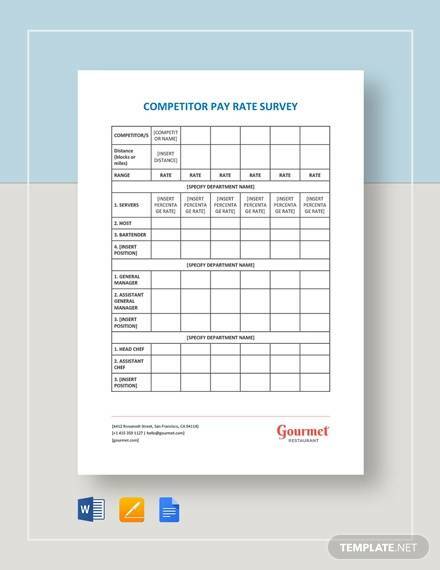 Record, analyze and measure the valuable feedback you will receive through your restaurant survey. 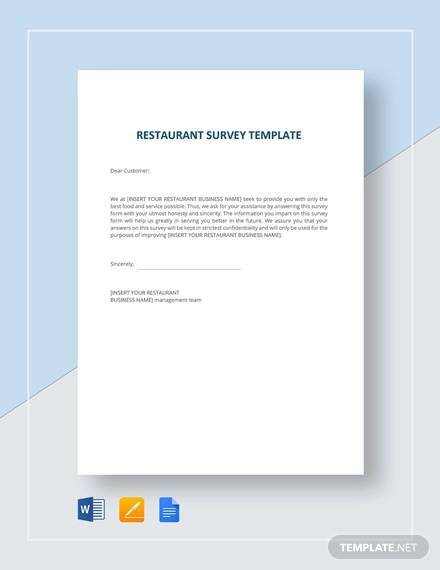 Download our templates and create a quantitative as well as qualitative survey and help your restaurant business to climb the ladder of success.